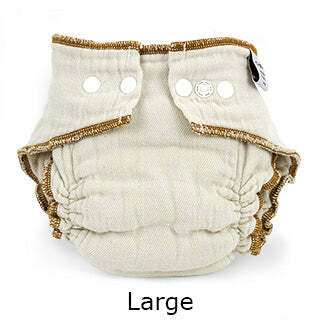 Our everyday low prices shown reflect the direct-from-the-manufacturer savings on Cloth-eez® Workhorse™ Diapers. Compare at price shown is full retail price elsewhere. Choose snap or no-closure (pinnable or Snappi-fastenable) version. Snap closure on this page. Sold individually. Cloth-eez® Workhorse™ diapers are made of wonderful 100% cotton prefold diaper fabric in fitted diaper shape with a built in flap style doubler. 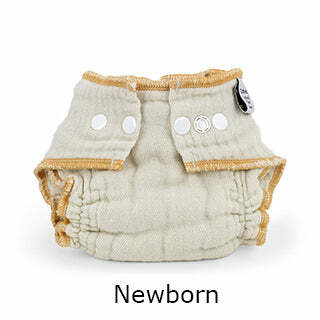 Newborn and small have 6 layers in the flap and medium and up have 8 layer flaps, which is age-appropriate layering.Did you ever wish your lovely prefolds were shaped like a fitted? 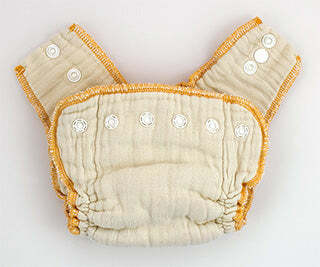 There is no better diapering fabric than the cotton prefold fabric. It washes so easily and wears so well. No polyester stink, no repelling, no special detergents are needed for 100% cotton diapers. The snaps are covered by the cotton fabric inside so no snaps touch baby. 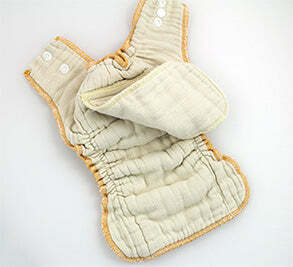 The flap style doubler is sewn inside in the back only for quick drying. See pictures on a baby here. 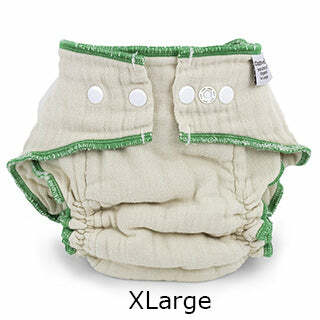 Designed by Karen and made exclusively for Green Mountain Diapers. I love cotton diapers, especially prefolds, but sometimes a fitted style is preferred. This is an economy fitted with great low price and no confusing adjustments which create additional bumps and lumpy places. It's not fancy but it does the job really well at a great price. 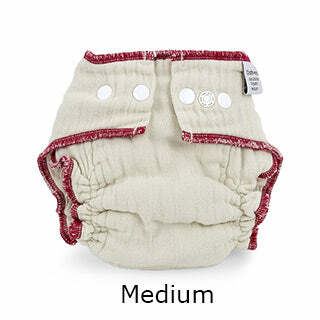 Sized diapers fit better than "one-size-fits-all" diapers because young babies are little and older babies are bigger. Yup, that's true. We made the wings a little longer on the no-closure version to give you more fabric to use for pinning or fastening them but the rise is the same for both versions. Consider baby's shape when choosing size. Wide, round "booty" shapes will need to size-up sooner than narrow, flat-bottom shapes, who will stay in a smaller size longer. Very fast growing newborns can skip size small and go from Newborn to Medium. The cotton used to make the diapers was grown organically. They are made of organic cotton. 100% cotton exclusive of trim. Made in Pakistan. For the same thing in WHITE cotton, go here. Please note that you can use any mainstream laundry detergent on cotton diapers. You do not need to purchase "special for cloth diapers" detergents. We do not sell them and they are not needed on prefolds or Workhorse diapers. Keep it simple. Use what you would normally use on your regular household laundry. Yes, Tide is ok or whatever you happen to like. This is a diaper which means it is the absorbent part. Use a diaper cover over this diaper, which is not included. Both White and Organic versions are also available without the snaps, called No Closure and Organic No Closure.